How to beat a STRONGER opponent? In the previous lesson, we analyzed the correct attitude and mental approach when facing WEAKER opponents. Now let’s talk about the flip side of the coin: the right mental approach when facing a STRONGER opponent. Just like in the previous scenario, there are some typical mistakes (which most players make), and I have some important practical recommendations and antidotes for these mistakes. Without further ado, let’s go! 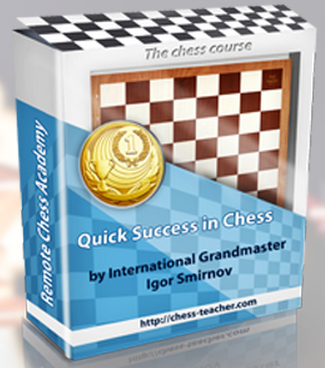 Most chess learners enjoy watching/reading the games’ analyses made by top Grandmasters. This is exciting indeed! At the same time, however, these comments are often not very clear to the viewer/reader. Recently I have received a lot of questions about blitz games. Here I will answer them all. –> Is it useful or harmful to play blitz? When you play a blitz game, you have no time to think. Therefore you use the things you ALREADY know. Thus you do NOT learn any new skills. In the previous issue we’ve been talking about “the most powerful ideas in chess”. I’ve told you why many players don’t have chess progress despite their persistent trainings. It happens because they try to learn many abstruse ideas and can’t apply them practically afterwards. That’s why a reading of numerous books often doesn’t help. Last time I’ve asked you to perform one task (to play against a computer and to use the defensive ideas I gave you). Those who tried to perform this task found that it is almost impossible to do it practically. Chess trains your mental skills. Chess gives you deep understanding of strategical principles. If that sounds logical, then why is it that MOST chess players can’t seem to apply their trained mental skills in reality? Read on! First off, a word of warning: this lesson is NOT for everybody! Instead of giving you answers, I’ll keep asking you questions. This isn’t some passive reading stuff. You’ll need to keep THINKING all the time…Sounds frightening? Can you imagine a sea captain who tries to reach a distant land without a map? Can you imagine a motorist driving with closed eyes? Of course not. If you want to achieve a certain distant goal, you need to have a map that will show you the right way. This relates to your chess goals as well. Most players study chess rather haphazardly. They watch the videos that look nice, and read books that are popular or seem good to them. Chess teaches us strategic thinking. You’ve probably heard that you must have a PLAN while playing. And it’s better to have a bad plan than not to have any plan at all. It would be wise to use this rule while playing chess and in other situations as well. What is your PLAN for chess progress in 2013? I’ll give you some hints in the next issue, but I’d like that you think about it by yourself first. If you have a PLAN it doesn’t guarantee your success, but gives you a chance for it. If you don’t have a PLAN you have almost an absolute guarantee of failure. Give it a try. And remember: it’s better to have a bad plan than not to have any plan at all. To conclude, I’d like to give you 2 cool puzzles. As usual, your task is to find the best move and calculate the resulting variations. Central squares are usually very good for a knight. This time, however, White’s centralized knight is suddenly trapped! Can you see any way to escape? Black puts pressure over the c-file and is trying to develop a king-side attack. What should White do?